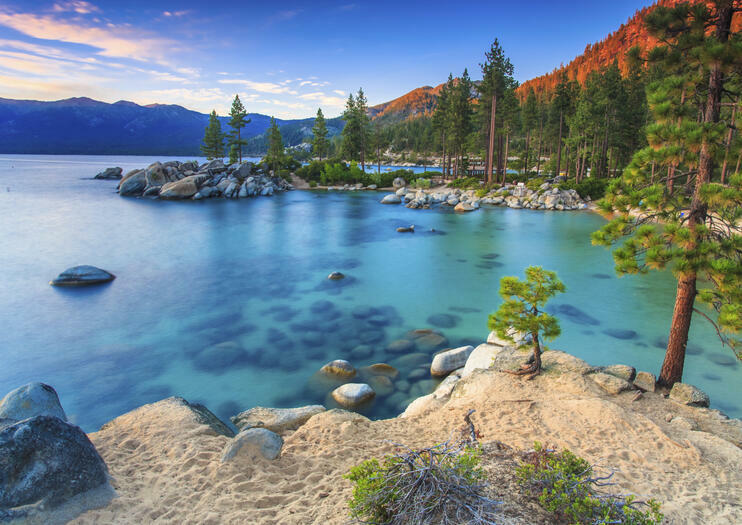 With its pristine waters, long stretches of sandy beach, rocky coves with giant boulders, and stunning panoramic views, Sand Harbor is one of the most popular beaches at Lake Tahoe. It’s the ideal place for the whole family to enjoy a day of fun in the sun surrounded by some of Lake Tahoe’s most spectacular scenery. With 55 acres (22.2 hectares) of beach and forested areas, there’s plenty to do at Sand Harbor. Multiple beaches offer sunbathing, swimming, snorkeling, and even scuba diving. Don’t miss the many giant boulders here, great for climbing or jumping off. Hire kayaks or stand-up paddleboards (SUPs) from the on-site rental shop and paddle to nearby hidden coves and beaches. Or take a break from the water and hike into the woods or have a barbecue or picnic under the shade of pine and cedar trees. Part of Lake Tahoe Nevada State Park, the beach has extensive amenities. Visitors can easily spend a few hours or even a full day at Sand Harbor. Those short on time should book a Lake Tahoe circle tour. For a different perspective, take a hot-air balloon ride or helicopter tour. Sand Harbor is a must for first-time visitors to Lake Tahoe. Don’t forget to bring your camera to capture the stunning scenery. The facilities include parking, restrooms, concessions, a restaurant, barbecue and picnic areas, a gift shop, watersport rentals, and a boat launch. Alcohol is permitted on the beach, but glass containers are not. There are wheelchair-accessible paved walkways at Sand Harbor. The Sand Harbor Nature Trail is also wheelchair accessible. Sand Harbor is located on the east side of the north shore of Lake Tahoe, about 3 miles (4.6 kilometers) south of Incline Village on NV 28. From Memorial Day to Labor Day, regular buses run from Incline Village. During the peak summer season, arrive early to get a parking spot. Stay for the amazing sunsets. The annual Shakespeare Festival runs during July and August—a wonderful opportunity to see performances against a stunning natural backdrop. For fewer crowds, visit during the week in the shoulder seasons. Mountain bikers should check out nearby Flume Trail, one of the most scenic rides in Lake Tahoe. An exciting, mostly single track 1,600 feet (488 meters) above Lake Tahoe, there are stretches of uninterrupted views of the lake and sheer drop-offs for added excitement. Most riders start at Spooner Lake, also part of Lake Tahoe Nevada State Park; a shuttle also runs from Tunnel Creek Café. Tahoe photographic tours offer a unique way to enjoy Lake Tahoe’s natural wonders and receive photography tips as you are led by an experienced photo guide who provides tips and shares information about the area. Whether you’re looking to snap a poster-worthy shot of snow-covered mountains, towering trees, wild flowers or the glassy lake itself, you’ll learn how to shoot in the great outdoors and see some of Lake Tahoe’s most beautiful natural sights, including Emerald Bay. Select either a half-day or full-day tour. Enjoy a minute complimentary ride to the Truckee Airport upon meeting at our HeliTahoe offices in Truckee, where you’ll meet your pilot and take part in a short safety briefing prior to boarding.Then, you’ll be ready for your 30-minute scenic window seat flights over the second deepest lake in the U.S! Experience an amazing flight along the east shore over Stateline and then northbound to the breathtaking Glenbrook Bay, Secret Harbor, Skunk Harbor, and Chimney Beach. Then it’s on to the sparkling waters of Sand Harbor, the ultimate destination. Along the way, see numerous ‘hidden beaches’ to hike to after your flight!